In the ongoing effort to demonise the work of Professor Michael Mann in particular, Anthony Watts, Steve McIntyre, Judith Curry and John Christy are passing around wrong and worn out "arguments", presumably to try to bolster a defense for the people who allegedly libelled Professor Mann. It's a pathetic effort on behalf of a pathetic lot from the climate science disinformation brigade. In a repost at WUWT, Steve McIntyre (and Anthony Watts) are arguably wanting to be added to the list of people being sued. It's as if they think that if they misrepresent history often enough someone will believe them. I don't know what point they think they are trying to make. It looks as if they are trying to resurrect "trial by email", which has been tried before and failed dismally. (Update: see especially Marco's comment below, and the links to deepclimate's damning indictments of Steve McIntyre here and here). Regarding the Hockey Stick of IPCC 2001 evidence now indicates, in my view, that an IPCC Lead Author working with a small cohort of scientists, misrepresented the temperature record of the past 1000 years by (a) promoting his own result as the best estimate, (b) neglecting studies that contradicted his, and (c) amputating another’s result so as to eliminate conflicting data and limit any serious attempt to expose the real uncertainties of these data. Firstly, John Christy was also a lead author of Chapter 2 of TAR, the chapter in question, so he is as culpable as any other lead author of its content. The other lead authors were: R.A. Clarke, G.V. Gruza, J. Jouzel, M.E. Mann, J. Oerlemans, M.J. Salinger, S.-W. Wang. In addition there were two coordinating lead authors of Chapter 2, C.K. Folland, T.R. Karl, who presumably vetted the final content. And two review editors: R. Hallgren, B. Nyenzi who would also have had a say. And nearly 700 "expert reviewers". So to my way of thinking, to put imagined "wrongs" of any single IPCC report (which has been twice superseded) on the shoulders of one lone individual and neglect the more than 850 other people who played a part, is a bit much! What it demonstrates is the Serengeti Strategy so beloved of disinformers and deniers. This time they try to isolate one individual from a very large herd. Secondly, the chapter did not misrepresent the temperature record of the past 1,000 years. At the time, arguably the paper by Mann and colleagues was indeed the "best estimate". In any case, Chapter 2 of the IPCC TAR included references to other reconstructions with citations and charts. Thirdly, there have been two more IPCC reports since TAR and they present more recent research, which has refined knowledge with new data and multiple new temperature reconstructions, all of which lend support to earlier findings. Further, both the Oxburgh and Muir Russell reports concluded that the IPCC 2001 graphic was “misleading”. 25. The WMO report is a short document produced annually. It does not have the status or importance of the IPCC reports. The figure in question was a frontispiece and there is no major discussion or emphasis on it in the text. 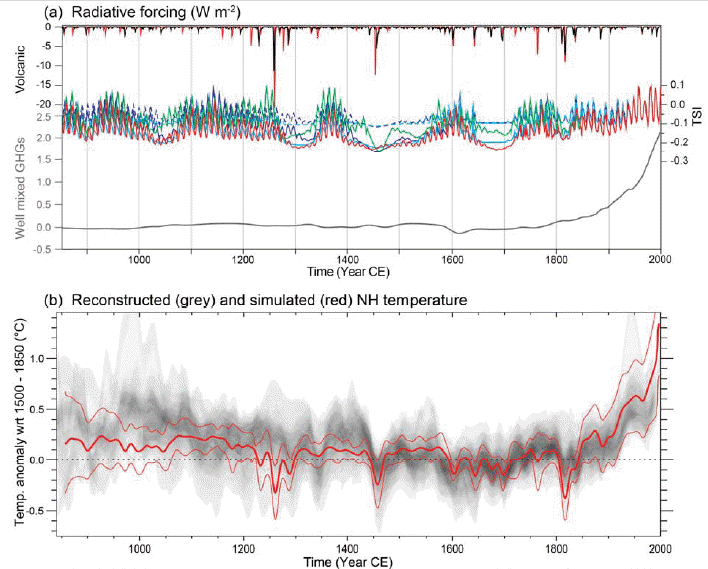 The caption of the figure states: "Northern Hemisphere temperatures were reconstructed for the past 1000 years (up to 1999) using palaeoclimatic records (tree rings, corals, ice cores, lake sediments, etc. ), along with historical and long instrumental records”. 26. Finding: In relation to "hide the decline" we find that, given its subsequent iconic significance (not least the use of a similar figure in the TAR), the figure supplied for the WMO Report was misleading in not describing that one of the series was truncated post 1960 for the figure, and in not being clear on the fact that proxy and instrumental data were spliced together. We do not find that it is misleading to curtail reconstructions at some point per se, or to splice data, but we believe that both of these procedures should have been made plain – ideally in the figure but certainly clearly described in either the caption or the text. Recent public discussion of climate change and summaries and popularizations of the work of CRU and others often contain oversimplifications that omit serious discussion of uncertainties emphasized by the original authors. For example, CRU publications repeatedly emphasize the discrepancy between instrumental and tree-based proxy reconstructions of temperature during the late 20th century, but presentations of this work by the IPCC and others have sometimes neglected to highlight this issue. While we find this regrettable, we could find no such fault with the peer-reviewed papers we examined. I think it's worth emphasising what the Oxburgh report noted. For example, one of the papers referred to in TAR emphasizes uncertainties and limitations in its title - Mann, M.E., R.S. Bradley, and M.K. Hughes, 1999: "Northern Hemisphere Temperatures During the Past Millennium: Inferences, Uncertainties, and Limitations". Geophys. Res. Lett., 26, 759-762. Since that paper was published there have been numerous other reconstructions. When you take them together with the instrumental records you end up with a hockey stick! For the avoidance of misunderstanding in the light of various press stories, it is important to be clear that the neither the panel report nor the press briefing intended to imply that any research group in the field of climate change had been deliberately misleading in any of their analyses or intentionally exaggerated their findings. Rather, the aim was to draw attention to the complexity of statistics in this field, and the need to use the best possible methods. The main point, though, is that all this is past history. There has been a lot more work in the thirteen years since then. While climate science deniers are obsessed with misrepresenting the past, we keep marching on toward hotter global temperatures and rapidly changing climates. The world hasn't even stopped increasing annual CO2 emissions, let alone reduced them. Christy referred to a "small cohort" of scientists, which could refer to everybody involved. "Small" is, after all, relative. Christy also says that this is "in his view"; in that same view evolution is a crock and a supernatural being is going to save us from ourselves anyway. Or at least it'll save a small cohort of the elect. I see they are still promoting McIntyre's original story that Mann supposedly "[amputated] another’s result so as to eliminate conflicting data and limit any serious attempt to expose the real uncertainties of these data"
including the damning e-mail in which Mann gets sent the data, truncated already at 1960, showing McIntyre's story is a piece of made-up nonsense. No surprise that Christy repeats that stuff. Thank you, Marco, for that reminder. It's as good a demonstration as any of what a low-life Steve McIntyre is and why he is regarded with so much contempt by everyone who might have heard of him. Correction, if I may, Sou: he's only regarded with contempt by those in touch with reality. His sycophants worship the very ground he walks on. According to them, he can do no wrong, and this is the type of individual you encounter on many a climate change fora. 1) Use .9 vs .2, or, increase persistence to create a distribution of graphs with wilder swings, but in both directions, as people like Noel Cressie told Wegman (and were ignored). 2) Invent a metric Hockey Stick Index that sorts by resemblance to positive hockey stick, then throw away 99%, leaving the 1% that look most like MBH99. This is like doing a random walk via coin flips with an honest coin, then picking the 1% that ended furthest positive and claiming the coin is biased. The most coherent feature in nearly all of the regional temperature reconstructions is a long-term cooling trend, which ended late in the nineteenth century. The contrarians are simply lying, as Michael Mann has pointed out. Here's a figure from that article demonstrating the close agreement between the PAGES-2K reconstruction and MBH99. This is the fruit of many years of work since MBH99. The scientific evidence is what it is. The contrarians are simply lying and it is astonishing that this sustained and vile display of calculating mendacity is tolerated anywhere at all, let alone heard at the highest levels of government in the US and indeed elsewhere. The original document was an information sheet the debated graph was a simple "GRAPHIC" not meant for scientific study. Front cover: Northern Hemisphere temperatures were reconstructed for the past 1000 years (up to 1999) using palaeoclimatic records (tree rings, corals, ice cores, lake sediments, etc. ), along with historical and long instrumental records. The data are shown as 50-year smoothed differences from the 1961–1990 normal. Uncertainties are greater in the early part of the millennium (see page 4 for further information). For more details, readers are referred to the PAGES newsletter (Vol. 7, No. 1: March 1999, also available at http://www.pages.unibe.ch) and the National Geophysical Data Center (http://www.ngdc.noaa.gov). They refer the reader to this document where on page 8 one finds the hiding of the decline by publishing it. The Serengeti strategy tends to fail when the lions are old, slow, dumb and toothless and the antelope/zebra/buffalo fight back. Even more when the lions are actually jackals.